Homicide: Life on the Street: Fallen Heroes Part 1 (1998) [Nathaniel Lee 'Junior Bunk' Mahoney]: Shot repeatedly by police after he grabs an officer's gun and opens fire in the police station. 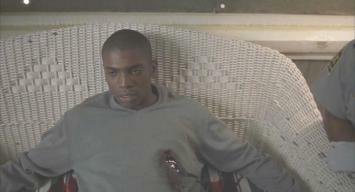 O (2001) [Odin James]: Commits suicide by shooting himself in the chest on the sorority house porch, after police surround him to arrest him for killing Julia Stiles. ER: Life After Death (2008) [Dr. Gregory Pratt]: Dies of injuries from an explosion (occurring in the previous season-ending episode The Chicago Way). Flypaper (2011) [Darrien]: Killed in an explosion when he uses an acetylene torch that had been booby-trapped by Jeffrey Tambor.